NBA Finals kick off their first game this Thursday with the Cleveland Cavaliers and the Golden State Warriors putting everything on the line for the Larry O’Brien championship trophy. It’s no secret that one of the things that keep these men motivated during a long basketball season is the love and support of their wives and girlfriends. As the season comes to its final leg, you can find Ayesha Curry, Teyana Taylor, Savannah James and Christina Iguodola taking their support to the next level as their men face off to become the league’s best team. You can catch the NBA’s leading ladies sitting court side rocking the flyest team gear, catching jets to away games and shouting for every 3-point score. Check out some of their recent game day pictures showing support for their favorite basketball player. Before Ayesha boarded a jet to Oklahoma City during the Western Conference finals, she hit the running man in celebration of getting another game closer to victory. She might not be your baby, but Savannah is definitely Lebron’s as she shows her game day support in a coordinated outfit. Christina Iguodala shares a squad moment with her husband and his son during a post-game snap. 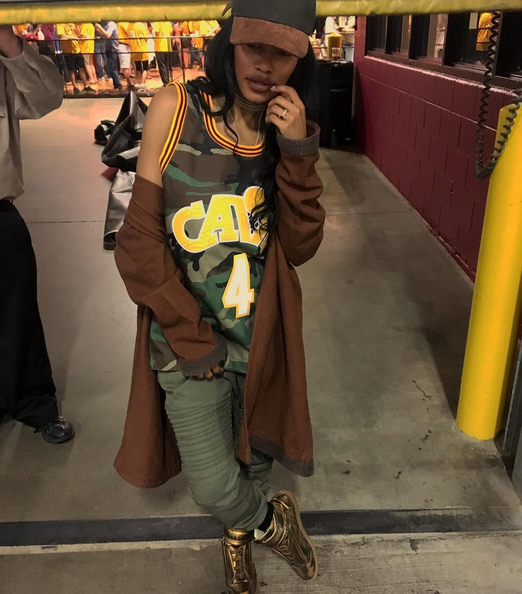 Teyana Taylor wanted to match her guy’s fly by rocking a custom camo jersey in support of her daughter’s father, Iman Shumpert.